Pakistan's tryst with individual dictators seems to last for about 10 years. Even Ayub Khan (1958-69), who had the advantage of assuming charge when dictators everywhere were America's favorites, couldn't last much longer. He was the only one whose dictatorship did not alternate with phases of (usually uncertain) democracies. He handed over the reins to Yahya Khan (1969-73), the most unprepossessing of all tin pot tyrants. Not surprisingly, Yahya's was the shortest stint if only because he also presided over Pakistan's break-up and the demise of the two-nation theory. 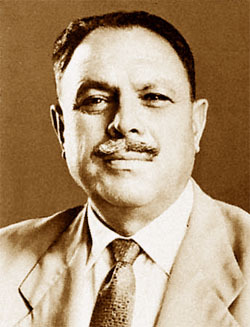 The third, Zia-ul Haq (1977-88), had the usual decade-long shot at power, and may have lasted longer but for the still unexplained plane crash that killed him and the US ambassador to Pakistan. And now Pervez Musharraf (1999- ), another of Washington's favorites, is in trouble as he nears the end of the fateful 10-year period. It is not easy to explain why a dictator's hold on power begins to slip after a decade but it is possible that the customary stirring rhetoric with which he assumes charge begins to pall after a time. Like dictators all over the world, their Pakistani counterparts also invariably ascend to power with the promise to clear the mess created by corrupt and inefficient politicians and usher in a new era. Usually, they are believed because of the unedifying record of politicians. But, then, slowly the popular expectations begin to fade. If Ayub began with heaps of accolades, it was presumably because he was the first -- and the people of Pakistan hadn't tasted much of either democracy or dictatorship at the time. And what they had seen of democracy till then hadn't reinforced their faith in the concept. So they cannot be blamed if they placed their faith in the pledges of the purported 'strong man', which is the image that all autocrats propagate about themselves. Some Americans, too, saw in him a larger-than-life figure. What Samuel P. Huntington of the subsequent Clash of Civilizations fame said about the dictator defies belief: "More than any other political leader in a modernizing country after World War II, Ayub came close to filling the role of a Solon or Lycurgus, or 'Great Legislator' on the Platonic or Rousseauean model." As is now known, the penchant of this American academic to jump to conclusions was later confirmed by his better-known theory on civilizational conflicts. Such extravagant praise may have inflated Ayub's notions about himself, for he tried to introduce a new system of 'basic' democracies after declaring that the kind of democracy practiced in the cold West is unsuitable for a hot country. Then, like two other dictators - Yahya and Musharraf - Ayub undertook what most Pakistani military rulers think would consolidate their position - start a war with India. But the 1965 conflict, undertaken in the belief that India had been weakened by Jawaharlal Nehru's death, was a disaster. According to Stephen Philip Cohen in his The Idea of Pakistan: "None of Pakistan's Western allies came to its rescue and Pakistan's newest ally, China, only made sympathetic noises." The war might have also sown the seeds of the country's disintegration. As Cohen said: "It revealed to the East Wing that Pakistan was a Punjab-centric state whose army defined both the idea of Pakistan and the security parameters of the state of Pakistan in a manner that was incompatible with Bengali interests." In 1971, Yahya Khan reaped what Ayub had sown, with the liberation of Bangladesh cutting Pakistan in half. But the failures of the two despots did not dampen the enthusiasm of other army generals. Again, the fragility of the political system and the failure of the institutions to consolidate their autonomy helped the autocrats to pose as saviors. Institutional immaturity was never more evident than when Zia-ul Haq used the judiciary to eliminate Zulfiqar Ali Bhutto through a death sentence. Again, in Musharraf's time, the judiciary showed its frailty when it approved of the 1999 coup by describing it as a step taken under a fictional "doctrine of necessity". It is only now under a new chief justice, Iftikar Muhammed Chaudhry, that the Supreme Court seems to have acquired a spine. It may have also been inspired by the independence demonstrated by the Indian judiciary, which also suffered a lapse during the 1975-77 emergency regime under Indira Gandhi. But it isn't only institutional autonomy - of the judiciary, the Election Commission, the bureaucracy - which is the need of the hour in Pakistan. Even more important is the development of viable political parties. Unfortunately, their growth has been stymied by the dictators. While Ayub's 'basic democracy' had little time for parties, excepting the dictator's own which was called Conference Muslim League - like Musharraf's Pakistan Muslim League (Quaid) - Zia-ul Haq's focus was on the Islamization of society and especially of the army. Zia allowed the fundamentalist Tablighi Jamaat to operate freely within the army and himself appeared before the Tablighi's annual convention. He also developed a tactical alliance with the Jamaat-i-Islami to counter relatively liberal organizations like the Pakistan People's Party. These fateful steps attained their fruition in Musharraf's time when Pakistan openly aligned with the Taliban and Al Qaeda till the latter's 9/11 strikes against America. But even today, as the recent arrest of terrorists in Germany revealed, training camps for Islamic militants continue to operate in Pakistan. As is known, India has long alleged that sections of the Pakistan Army and Inter-Services Intelligence (ISI) are in league with the terrorists. But whether or not each dictator rules for a decade, their combined legacy has been to turn Pakistan into "the most delinquent of states", in the words of Bernard-Henri Levy, the French intellectual and author of "Who Killed Daniel Pearl?"